VISITING Henley Hawks Women suffered a 29-14 defeat at Chetlenham Tigers on Saturday on their newly-built 4G pitch at Newlands Park. The Hawks travelled with a lot of new players due to injuries and unavailability in the pack. Several players were starting for the first time and nerves were high before kick-off. The match started positively with the Hawks players setting the tone in defence with Collins leading the line-up and making hits. Hearn and Edwards made inroads with the ball in hand and new forwards Page and Bowring carried well. Cheltenham began leaking penalties for foul play kept the pressure off Henley for a while, but the Tigers edged their way into the Hawks 22. Simpson’s wiles on the deck led to good turnover ball for Henley to attack from while Wysocki-Jones carried powerfully from the back of the subsequent scrum. A high tackle from Cheltenham gave Hearn the opportunity to take a lead but the penalty was missed. 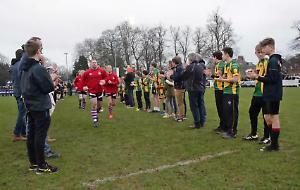 This was followed by a cruel seven-point swing as Cheltenham moved the ball efficiently to their pacey fullback and good support allowed the to score under the posts. The Hawks were not deterred and quickly made it back into the Cheltenham half with strong interplay from the backs working the ball wide to Williams who offloaded to Wilkie. However, the pressure didn’t convert into points and once again Cheltenham managed to move swiftly to the Henley 22, converting pressure from a scrum into a try out wide to make it 12-0. The Henley team kept the pressure on with half-time approaching and even forced the ball over only to be held up. The last play of the half saw the a ball make it through to Hill on the wing for a try which was converted to leave the score 12-7.
Henley started the second half full of energy and were quickly on the Cheltenham try line, only to knock the ball on see the Tigers go the length of the pitch for a runaway try. This was followed immediately by two more Cheltenham tries to move the score on to 29-7. Henley needed to get a foothold in the second half and big tackles from debutants Etheridge and Black gave them that impetus. After an act of foul play from the Cheltenham number eight which led to a bloody nose for Etheridge, Henley found themselves putting the pressure on in the opposition’s 22. As the Tigers tried to exit, good reactions from Baker saw her run in an interception under the posts. It was converted to move the score to 29-14, and more importantly within the losing bonus point margin. Realising that they still had something to fight for, Henley forced Cheltenham into their own half, and the home team ended the game kicking the ball dead from a penalty.